I am so excited to share this project with you today. With a little change of papers, this card would be perfect for Christmas. Replace the blue with pink, and it’s a baby girl card. Switch out the letter ‘J’ with a ‘B’ and it could be a baby boy card. The options with the Sapphire Simply Tags combined with the Numbers and Letters dies are limitless! I would love to know how you envision using the alphabets on your cards. 1. Cut 12″x6″ rectangle from ivory cardstock and score across at 6″ down the long edge to a create 6″ square card base. 2. Cut a 5 7/8″ blue cardstock square and adhere to card base. 3. Cut a 5 1/2″ brown cardstock square and adhere to card base. 4.Cut a 5 3/8″ blue cardstock square and adhere to card base. 5. Cut a 5 1/8″ brown cardstock square. 6. Cut a 5″ ivory print paper square and adhere to 5 1/8″ brown cardstock square. 7. Cut a 3 1/8″x 4 3/4″ blue cardstock rectangle and adhere it to ivory print as shown. 8. Cut a 3″x 4 5/8″ blue cardstock rectangle and adhere it to blue cardstock rectangle. 9. Cut/emboss 3 tags from blue cardstock as shown. Using the die as a stencil, sponge brown ink before removing paper from the die. Attach copper brads as shown. 10. Thread brown ribbon and attach to layers as shown using adhesive foam squares on the back of the tag. Adhere ribbon to back of brown cardstock square using tape. 11. Adhere 5 1/8″ brown cardstock square to cardbase. 12. Cut/emboss 3 coordinating tag inset die from brown cardstock as shown. Adhere to blue tag using adhesive foam squares. 13. 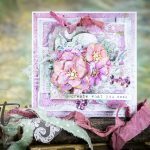 Trace the inside edge of the coordinating tag inset die and cut by hand. Adhere to brown tag inset. 14. Cut eyelet square die from blue cardstock. Sponge edges using brown ink and adhere to tags using foam squares. 15. 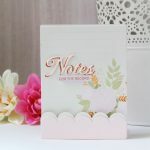 Trace the inside of the letter ‘O’ from the Numbers and Letters One die template onto ivory print paper and cut by hand. Adhere to tag layers. 16. Cut letters from black cardstock and adhere as shown. Save the extra letters to create additional words or phrases. Here, I’ve also set aside the words “Friend’ and ‘Hugs’ for cards I will create shortly. 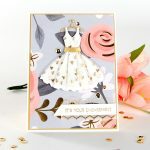 The Numbers and Letters One die templates are a terrific way to achieve a professional and personalized card. I look forward to hear what you are inspired to create with these dies.